I wrote a piece recently about how to bring down borrowing rates for Nigerians by using QE to bring down government’s cost of borrowing. The point of this was to get banks out of the (very profitable) game of lending money to the government and force them to move to lending to consumers. Over the last few weeks, the Nigerian yield curve has witnessed a spectacular collapse in the literal sense of the word, particularly at the short end of the curve where effective yields closed yesterday at 3.39% for the 91-day, 7.22% for the 182-day and 7.95% for the 364-day paper. This resulted in surprising results at the Nigerian Treasury bill auction yesterday with the Debt Management Office (DMO) refinancing short-term maturing government debt at 5.8% (91-day), 7.9% (182-day) and 9.48% (364-day). For comparison in December last year, the DMO issued a one-year paper at an effective yield of 19% while for much of the year secondary yields were above 10%. The crash on the yield curve contrasts with the underlying fundamentals of the economy for several reasons. Firstly, as an oil dependent economy, the collapse in oil prices means Nigerian debt is more risky and as such should demand higher premiums. Ditto the ratings downgrade by S&P this year, which lowered Nigeria’s credit rating to B+ from BB-, though notably, Moodys’ and Fitch left Nigeria unchanged. Secondly, the implication of the lower fiscal revenues means that the Federal Government (FG) should borrow more this year, which given the dominant nature of FG debt in the domestic debt market should translate to higher yields as supply rises. A third rationale for the argument over higher yields was monetary policy. With the NGN under pressure, the Central Bank of Nigeria (CBN)’s forward guidance at November 2014 MPC, where it announced a 100bps increment in the monetary policy rate to 13%, was hawkish. The goal of the apex bank was to keep domestic interest rates high so as to sustain foreign investor interest in Nigeria as higher rates, compared to other emerging markets, should attract foreign portfolio investors which will support the NGN. Towards this end, the usual tightening tool came to the fore: elevated issuance of OMO bills and deployment of all kinds of liquidity sucking tools to keep financial markets tight so that rates are high. Fast forward to September 2015 and JP Morgan’s decision to oust Nigeria from its treasured EM bond index, which the American bank blamed on the new FX market system, the rationale for tightening suddenly floundered. Amid a rapidly deteriorating economic picture with GDP growth sliding to record lows what then is the rationale for tightening? Indeed, with the worst having occurred, the CBN it would seem decided there was no point stifling the domestic environment anymore to appease foreign portfolio investors. Indeed language from Nigerian policy makers changed tone afterwards, from one which took glory in Nigeria’s listing in global indices to one which basically said ‘eff these ineffable foreigners’, Nigeria for Nigerians! As it was a liquidity squeeze that the CBN used to keep yields tight, so it was going to be a liquidity ease that would drive rates lower. Subsequently the CBN stopped rolling over maturing paper or bothering about excess liquidity, it simply let them mature. Then at the MPC, the apex bank delivered the first dovish policy since Sanusi began hiking rates in the fourth quarter of 2011 by reducing the cash reserve ratio to 25% from 31% previously. 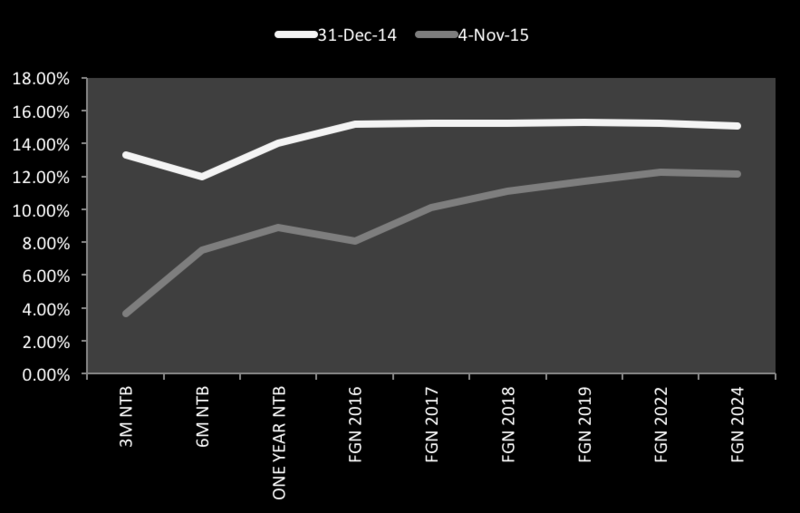 The result: liquidity levels began soaring over October with markets opening at one point over N1trillion naira. 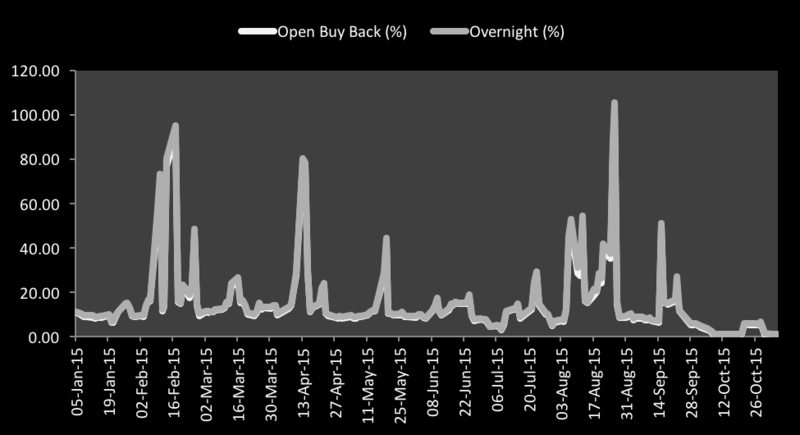 The first signs were on the interbank / open buy-back which crashed to 0-1%. After slamming that market down, the ‘idle’ liquidity weighed on the short end of the naira curve dragging that yield down as well before pulling down bonds. So how does this affect the price of crayfish in the market? For now it’s not likely going to mean much. It’s how long the depressed level persists. If the CBN follows through by firming up market expectations at the November MPC, then corporates are the most likely beneficiaries in the short-term. Thanks to the instrumentality of the FMDQ, corporate companies can now raise debt (short and long) in the market putting pressure on lending rates by banks to the segment. Banks will have to re-price loans lower over the next few quarters as corporates could easily test the market and with the risk-free government paper at depressed levels, the rates on the market could be much cheaper than banks. However, in terms of scale and size, banks still face a problem on the asset side of their balance sheet, in particular following the TSA implementation in September. The FG will not be issuing as much as previously as fiscal cash management improves. Even worse next year, the zero COT charges go into effect, which alongside the loss of FX trading income means non-interest incomes are going to come under pressure. On the loans side, corporate Nigeria is currently struggling with weak revenues and cannot be a sustainable outlet for the idle funds. Inevitably, banks will have to go down the credit curve and start lending to the man on the streets in the medium term which means they will need to lower the terms i.e. interest rates. The way things are set-up now CBN is everybody’s daddy, they’ve got the banks where they want them. A slight reduction in CRR would induce more of this liquidity easing. If the bank plays its cards right: avoid unwarranted OMO issuances and the government fiscal discipline improves, statements by leading APC politicians about driving down lower interest rates may not be a horse’s wish. So there you have it. To summarise – the CBN has decided to leave money in the market instead of mopping it up as it normally does. All that excess money is now hustling to lend to the government. Laws of demand and supply have therefore taken over – the greater the supply, the lower the price. I thank my guest who prefers to remain anonymous. what about the effect of this on inflation? which is over 9% and still climbing. That is always the risk. But the effects wont be felt for another 6 – 12 months at the earliest. If inflation starts to creep up on account of this, the CBN can always step in to mop up money as per usual. Please forgive me I have taken undue liberty to repost your article in my blog as the context of the article fits our aim. Interesting piece. A couple of observations though. The history of these liquidity spurts in the Nigerian market however suggests that it rarely ultimately translates into the democratisation of credit, though it may be different this time (consumer credit has to take off sometime, right?). This is usually because the negative inflationary outcomes or, just as likely, the currency pressures get in the way and force a rethink before the long-term credit expansion objective is achieved. Though perhaps the foreign portfolio investor angle can be discounted (as we seem to have given up on being an attractive investment destination), low (negative, in real terms at this point) interest rates mean there is no incentive for anyone to hold Naira. So, the presure on fx will only grow. Given the surreal official fixed rate environment we are now in, this will likely manifest (at least in the near term) as ever higher black market demand and prices. And whither the reported 8trn budget for 2016? If the govt is going to spend so much that will only widen the deficit and where will that money come from? Will it not require ever more debt issuance thus squeezing the currently flush system liquidity? If we can hold a fixed (“over-valued”) exchange rate while crashing interest rates and funding a record budget deficit, then we will have it all and make economic history. As you say, we continue to observe. This Nigerian financial year has been an anomaly. Government at all levels have only struggled to pay salaries, zero capital expenditure. Idle funds being generated by a seemingly idle government initiative. Let’s wait till the APC tells us how they intend to fund the 2016 Budget and the % of borrowing required to finance it before giving the common man a credit mirage. The partisan plug at the end is hogwash. The CBN is an independent institution.